In very simple terms, a Learning Management System (LMS) is a website that hosts eLearning programs and provides students and/or employees a way to participate in online training. Implementing an LMS with WordPress is something we have done for several clients here at WebDevStudios (WDS). For example, we implemented an LMS for Starbucks for their employee intranet. The corporation needed a platform they could use to train Baristas worldwide on the different drink recipes from their menu, as well as the equipment used to create those yummy treats! In this guide to building a Learning Management System with WordPress, I’ll take you though a plethora of common features that you should consider when developing your LMS, as well as plugins to help. Because WDS built a custom solution that uses WordPress, BuddyPress, BadgeOS and LearnDash, Starbucks’ employee intranet allows Baristas to log in, take quizzes based on training videos they’ve watched, and receive participation badges based on their training progress and quiz scores. An LMS has several different features for online training. When the time comes for you to consider building a Learning Management System for your organization, your first step should be to write out a list of the requirements you need. Then, begin your search for the options that are available to you. This article should help you get started on narrowing down your requirements based on some of the more common features available in today’s LMS platforms. Probably the most important feature of any LMS is the ability to create courses that meet the goals of your organization. Look for the ability to create categories of different types of courses, create lessons, quizzes, topics, and assignments for your learners. For the Starbucks example I mentioned at the beginning of this article, we built an LMS with WordPress that helped the company implement lessons that included a video for the learner to watch, followed by a quiz they had to take on the video they just viewed. In order to proceed to the next lesson, they had to finish the existing lesson with at least 80% accuracy. You care about the learning program, as well as the learners who are participating, so it is important to keep track of all the details and data surrounding your platform. A well-built LMS platform should provide you with the ability to track a learner’s progress, including how long that participant spent taking individual quizzes or assignments and all quiz attempts, as well as the ability to retrieve an easy-to-read detailed report that gives you an at-a-glance visual record of how well your students/employees are performing. Your LMS Dashboard should give you the ability to see detailed data, such as the number of learners in your program(s) and the number of courses and assignments (both completed and not completed). Additionally, it should allow you to utilize filters to drill down a view of more specific data, like the number of learners and their progress per course. With detailed reports, you can gain insights into your LMS and how your learners are utilizing the program(s). Being able to provide a learning platform online is a huge value to your organization, but having the tools available to manage that process is equally important. You should look for features like user profiles, a robust email notification process for learner engagement, group management, test expiration, clearing data, assigning grades, and rewards. Content is super important to any website, whether it is using an LMS, or not. However, when building a Learning Management System with WordPress, you should know that its Content Management System (CMS) offers the ability to create content that coordinates with your LMS offerings. WordPress CMS is pretty straightforward. Many LMS with WordPress integrations give you the ability to use a technique called ‘drip feed,’ which gives you the control to schedule lessons over a period of time and create a guided learning experience with options to schedule your lessons. For example, if you want to schedule lessons after enrollment in your platform on a specific date, you can easily do that through an LMS with WordPress platform. Additionally, using an email notification system within the LMS will ensure your learners receive notification on your selected lesson dates. A good LMS system will integrate into existing programs like a Human Resources Information System or billing systems, for example. WordPress already has a pretty robust API for third party integrations. Look for an LMS system, like LearnDash, that complements that with integrations for systems like Stripe, Zapier, MailChimp, Slack, Articulate Storyline, Adobe Captivate, to name a few. Good communication takes a lot of administrative time and overhead to accomplish successfully. A good LMS provides you with the tools and features you need to make communication easier. Features such as desktop application and notifications to give your users a visual reminder (in-browser or in-app) on their pending progress, plus automated notifications about their account, courses, and progress are all key to their overall learning experience. An active and dependable email notification system, when properly set up, can be a huge time saver for the administrators of the site. Notification can be set up to run automatically, reminding users about courses they need to take or steps they still need to complete, as well as automating emails to managers and instructors for things like course progress or regularly scheduled reports for courses they manage. There are a variety of ways to implement a community experience for your employees and learners when building a Learning Management System with WordPress. Even if it’s a private intranet, your users may appreciate that extra effort of making the system feel like a social community. Some examples of this are an Activity Feed, Leaderboards, Reviews, and Badges/Achievements, all detailed below. Activity Feed: On past client projects, we combined the BuddyPress plugin to provide an additional social layer to the LMS platform by allowing users to create full personal profiles, communicate with other learners in the program, and maintain an engaging activity feed, as well as Leaderboards, which display achievements of others who are also partaking in the courses and lessons. Leaderboards: Leaderboards are a great way to boost course engagement through powerful gamification. Online games wouldn’t be half as fun without the playful competitiveness of the leaderboard displaying who has crushed the most candy! Leaderboards tap into our competitive spirit, prompting us to keep moving forward. Reviews: We see it everywhere when we shop—online reviews from people who have purchased a product can be a huge determining factor on whether or not we will purchase the same product. LMS systems are no different. If learners have had a great experience with your program or a specific course, an LMS system can give them the ability to review and rate it so others who are considering taking the same course can gain insight from the reviewer’s experience. Badges: Gamification in a learning community makes it fun and exciting. By giving learners a visual reward that they can display on their user profile, or share on their social media profiles (Twitter, Facebook, etc. ), you can provide a fun way for them to display progress and achievements towards their goals. WDS was a partner in the creation of the official BadgeOS plugin for WordPress and BuddyPress, which allows you to easily create achievements and issue shareable badges as your users succeed. At the very least, your LMS platform should be responsive, meaning, it should be accessible on all devices: desktop/laptop, tablet, and smartphone. A responsive LMS platform provides you and your learners with access to the learning program(s) 24/7. From a learner’s standpoint, they can view their progress on-the-go with their smartphone, from the comfort of their living room couch on their iPad, or even in their home office on their desktop or laptop. From an Administrator’s standpoint, this gives you the ability to check progress and communication with your users from anywhere 24/7. When building a Learning Management System with WordPress, we are able to create a companion app for the iOS (Apple) and Android (Google) platforms that your users can download from the various App Stores (Apple Store and Google Play). The example shown here is an application we created for the YMCA. Depending on your audience, you may want or need to provide several language options for your platform. Although English is the default language for the WordPress platform, it is also internationalized for many world languages. The language translation files already exist to provide a website that offers more than one language variation. A good LMS integration for WordPress adopts this internationalization from the framework of the WordPress platform, so that you can make sure your courses, lessons, quizzes, and content are all available in the languages you require. Some organizations utilize WordPress and LMS integration to augment their existing training and onboarding needs for users, such as new or existing employees. However, there are also organizations out there that create online learning courses for profit and are interested in monetizing the courses they publish. Think about how an organization like Lynda.com has successfully published their vast library of training courses online. As a user, you can browse their library of available courses and then select and pay for the ones you wish to take. All of those transactions, including payment, occur online without leaving your website. The same is true for a WordPress website that has an LMS integration. You can put single courses up for a one-time purchase or create a recurring subscription that allows users to gain ongoing access to your library of training courses on a monthly or annual basis. You can also utilize eCommerce tools to create a membership site to sell membership access to your training site. Other options include creating course bundles, course licensing, or à la carte specials for one-time purchases, coupon codes, and discounts. The LMS plugins we work with for WordPress websites all have integrations with popular payment gateways, like PayPal, Stripe and 2Checkout; as well as full integrations with popular eCommerce plugins for WordPress including WooCommerce and Easy Digital Downloads. 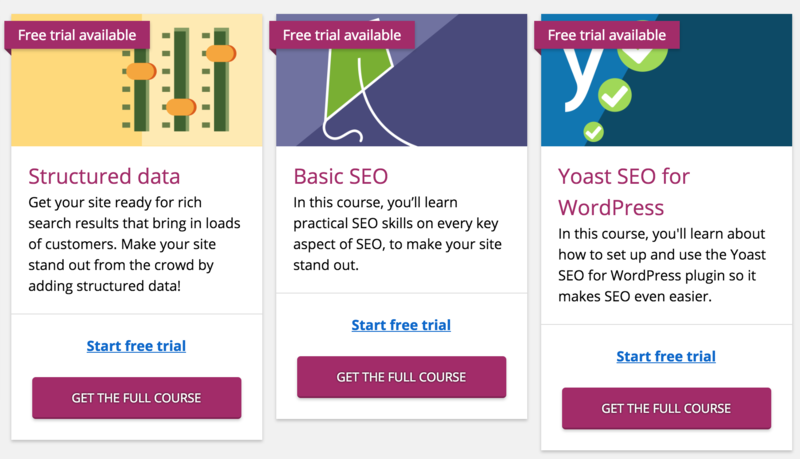 LearnDash is a commercial LMS plugin for WordPress that is easy to use for course management. You can create different kinds of courses with lesson plans and quizzes. The quiz offerings give you multiple ways of formatting quiz questions (multiple choice, long form, etc.) and allows you to set prerequisite conditions, such as requiring an 80% grade on the previous quiz before you can proceed to the next one (like we did for the Starbucks example). It also has a nice drip feed feature, which I mentioned earlier in this article, that allows you to create customized learning paths for your users. Sensai is an LMS plugin from the creators of WooCommerce. Sensai has built-in BadgeOS functionality to allow you to integrate badge rewards and achievements to provide some gamification to your online course offerings. It is a flexible LMS that allows you to create quizzes and assignments and gives you the opportunity to grade them manually, or automatically. It integrates well into the WordPress platform, allowing you to create a nice visual theme for your courses that match the branding and visual design of your website. Because it works on WordPress, content management is also a breeze—whether you need it for course content creation, blog posts, or articles on your website. I hope this article has helped you make some sense of the various offerings that are provided when building a Learning Management System with WordPress. This article does not come close to touching ALL the possible options and features, but it hits the high notes to give you a place to start when you are developing your list of requirements. Maybe you even found a feature or two that you had not previously considered. No matter the plugin you choose, WordPress is the best platform to run an effective, exciting, and dynamic learning management system because it is designed to make it easy for you and your organization to manage your content and overall website—leaving you the time to run your business. Whether you are a small business or organization looking to ramp up your online training offerings or a larger, corporate enterprise organization interested in making your company intranet or employee training a little more exciting and fun, get in touch with us about helping you implement the LMS you need. We have the experience and the passion to help you make it happen!